Moto Mountain Park is open year round, and we’re easy to find. The gates will close at 7:30pm daily. Please begin to pack for leaving the park around 7pm to avoid being locked inside the park. 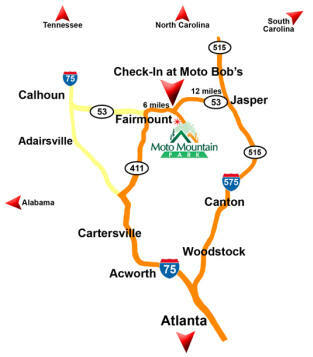 MMP is located right off HWY 53 between I75 and I575 in Fairmount, GA. No matter where you’re coming from in Georgia, we’re just a short drive away.